Joseph Wolf was highly respected as a wildlife artist and natural history illustrator. He was brought up in a village in the Rhineland Valley and from an early age enjoyed drawing birds and animals. John Gould's 57 watercolours of birds of prey, game and waterbirds for The Birds of Great Britain, 1873, was just one of his many commissions. Wolf had a huge influence upon Thorburn who wrote: 'Wolf's work is not only faultless as regards truth to nature, but there is, besides, an indescribable feeling of life and movement never attained by any other artist.' (A.H. Palmer The Life of Joseph Wolf, London, 1895). 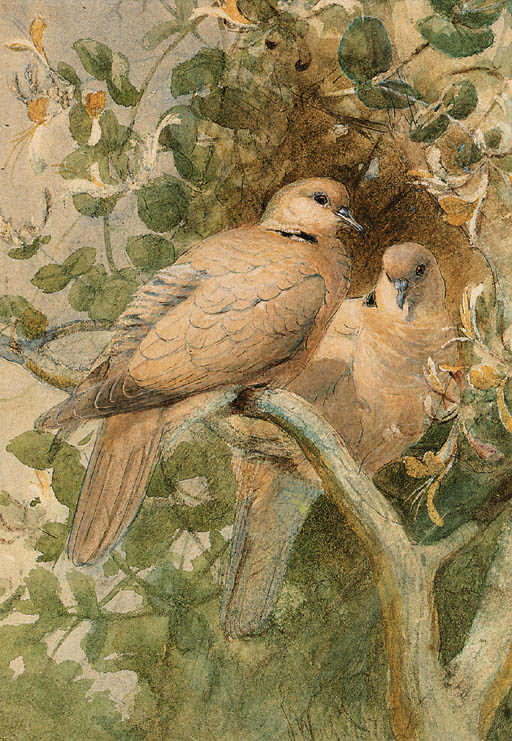 John Gould's 57 watercolours of birds of prey, game and waterbirds for The Birds of Great Britain, London, 1873, was just one of his many commissions. Wolf had a huge influence upon Thorburn who wrote: 'Wolf's work is not only faultless as regards truth to nature, but there is, besides, an indescribable feeling of life and movement never attained by any other artist.' (A.H. Palmer The Life of Joseph Wolf, London, 1895).